And there you have it. 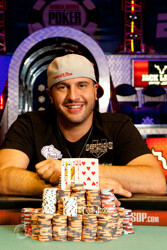 Michael Mizrachi is once again the $50,000 Poker Players Championship winner! After a five-day battle with some of the greatest poker players in the world, he came out on top. Mizrachi adds $1,451,527 to his massive list of results and he will now be in fourth place on the all-time money leader board. The final table started off with a massive bang as Mizrachi won three in a row right away. On the third hand of play, during No-Limit Hold'em, he knocked out both Bruno Fitoussi and Bill Chen. Fitoussi started the day as the short stack, and he moved all in for his final 170,000. Chen made the call, Mizrachi three-bet to 400,000 and Chen moved all in for his 1.2 million chips. Snap-call. Mizrachi showed , and was miles ahead of Chen, who showed . Fitoussi had and after the board, both Fitoussi and Chen hit the rail. 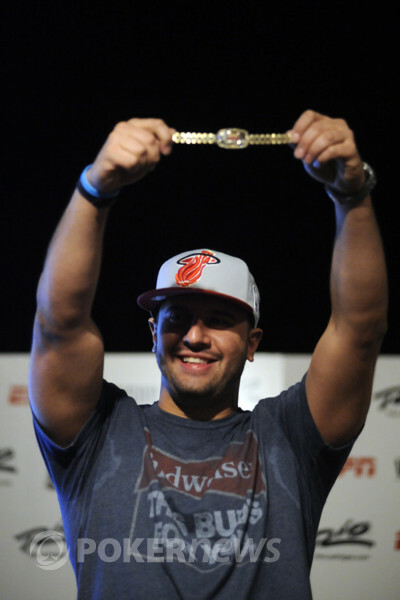 Right from the start Mizrachi crushed his opponents, and it seemed like he was in a hurry to get to the winners party. Stephen Chidwick was the next one to go out, earning $253,497. During Pot-Limit Omaha, Chidwick got his final money in on the turn with the board showing . Mizrachi tabled for a full house, and Chidwick was drawing slim with his . The river was the and Chidwick was gone. Mizrachi already had almost half the chips in play at that point. Roland Israelashvili was the most unexpected name at the final table, as he made the most of his $2,250 investment winning a satellite earlier this week. Israelashvili was the second shortest stack at the start of the day and earned himself $317,882 with his fifth-place finish. Israelashvili got his final chips into the pot in 2-7 Triple Draw when both Bloch and Mizrachi checked the hand down. Israelashvili ended up with a , but that was no good against Bloch's . Luke Schwartz was by far the most talkative player at the final table, and his needling comments had many players cracking up. Schwartz couldn't get anything going at the final table, but his fourth place finish is impressive to say the least. This cash marks Schwartz's first in a non Hold'em or PLO tournament and also his biggest to date earning him $406,736. During No-Limit Hold'em, Schwartz got his money in with and was up against Chris Klodnicki's . The board ran out and due to an unlucky river, Schwartz got eliminated. Klodnicki chipped up nicely and proved himself to be a real contender for the title. He took the chip lead, but that didn't last long. Back in 2006, when this tournament was hosted for the first time, it was Andy Bloch who played a record-setting-heads-up match for the title against the late Chip Reese. 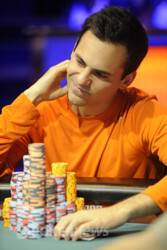 In 2012 Bloch came close again, but this time he busted out in third place earning $561,738. Bloch had a good shot at winning this thing with three players remaining, but eventually he ran into the brick wall that was Mizrachi. In Pot-Limit Omaha Bloch lost a big pot, and couldn't pull off a comeback. On Bloch's final hand he got his money in during Limit Hold'em, and both Klodnicki and Mizrachi called when he was all in pre flop. Mizrachi and Klodnicki both checked the flop, and Bloch got heads up when Mizrachi folded on Klodnicki's turn-bet. Bloch turned over and was facing . The river was the and Bloch was sent home. 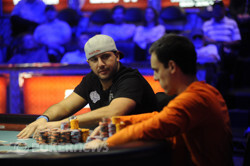 Mizrachi started the heads-up match with 10.5 million to Klodnicki's 5.7 million. For just a couple of hands Klodnicki got up to more than six-million chips, but from that point on it was the big Mizrachi show. Klodnicki stood no chance against the fearless, agressive and well-running Mizrachi who cruised to victory. On the final hand in Omaha-8, Klodnicki was all in pre flop and showed . Mizrachi tabled , and claimed the title when the board ran out . Klodnicki took home $896,935 for his efforts, but the massive first-place prize was for Mizrachi who won $1,451,527. On the button, Chris Klodnicki raised and Michael "The Grinder" Mizrachi called to see the flop. Mizrachi checked and Klodnicki bet. Mizrachi called. The turn was the and paired the board. Mizrachi checked, Klodnicki bet and Mizrachi raised. Klodnicki called. The river was the and Mizrachi bet. Klodnicki called. 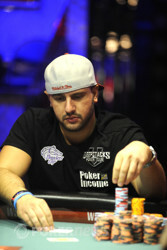 Mizrachi showed the for three kings and Klodnicki mucked, dropping down to 540,000 in chips. The flop came down and Mizrachi had a straight draw while Klodnicki picked up a flush draw. The turn was the and Mizrachi made a ten-high straight. The river then completed the board with the and that was it. Klodnicki couldn't hit to make the high and even make a low and was eliminated in second place. Klodnicki earned $896,935 for the largest score of his career, but wound up just short of the title. That goes to Mizrachi and a complete recap will be coming shortly, so stay tuned. Michael Mizrachi raised from the button, Chris Klodnicki defended his big blind. The flop came down and both players checked. The hit the turn and Klodnicki bet, Mizrachi folded. Finally a pot for Klodnicki who needs a whole lot more to come back in this thing. On the button, Chris Klodnicki limped in. Michael "The Grinder" Mizrachi raised and Klodnicki called. The flop came down and Mizrachi bet. Klodnicki folded. Every pot seems to be going Michael Mizrachi's way, and Chris Klodnicki can't find a way to stop his opponent. Klodnicki had the bring-in and Mizrachi completed. Klodnicki made the call. On fourth street Mizrachi checked to Klodnicki who put out a bet. Mizrachi raised and Klodnicki called. On fifth street Mizrachi paired his ace, he bet and took down the pot. Chris Klodnicki brought in and Michael "The Grinder" Mizrachi completed. Klodnicki called. Klodnicki then check-called on fourth and fifth, but check-folded on sixth and Mizrachi won the hand. Michael Mizrachi had the bring-in, Chris Klodnicki completed and Mizrachi raised. Klodnicki called and check-called all the way down to seventh street. Klodnicki saved himself one bet and folded to Mizrachi's final bet, and he's now severely short. From the button, Chris Klodnicki raised to 80,000. Michael "The Grinder" Mizrachi called from the big blind and the flop came down . Both players checked. The turn paired the board with the and Mizrachi checked. Klodnicki bet 100,000 and Mizrachi folded. On the next hand, Mizrachi raised to 90,000 on the button and Klodnicki called to see the flop come down . Klodnicki checked and Mizrachi bet 100,000. Klodnicki called. On the turn, Klodnicki checked and Mizrachi upped his bet to 255,000. Klodnicki gave it up and Mizrachi won the pot. From the button, Chris Klodnicki raised to 80,000. Michael Mizrachi called from the big blind and the flop came down . Mizrachi checked and Klodnicki bet 80,000. Mizrachi called. The turn was the and Mizrachi checked. Klodnicki bet 200,000 and Mizrachi called again. Mizrachi showed the for a rivered pair of aces and Klodnicki mucked his hand.